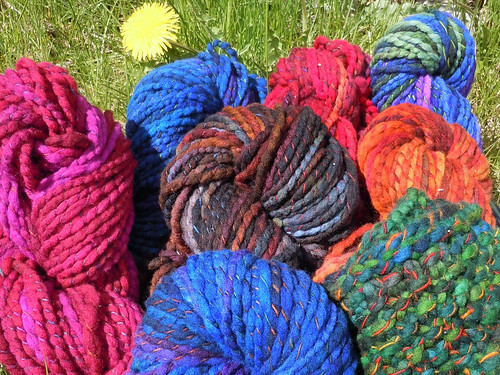 Mountain Colors Hand Painted Yarns: Yarn Giveaway!! It’s time for another yarn giveaway! This month we are featuring a brand new collaboration between Mountain Colors yarn and the Mountain Meadow Wool mill in Wyoming. We are so excited to be combining our talents – Mountain Meadow Wool spins the yarns and we hand paint them in our original colorways. This is your opportunity to be one of the first people to get your hands on this exciting new yarn venture! This month we are offering three kits and three different ways to win them. That means that three lucky participants will win a kit containing a gorgeous skein of our first collaborative yarn, the just-released Mountain Fusion Teton. Along with this super-squishy bulky merino yarn, you’ll also receive your choice of one Mountain Colors pattern to knit or crochet yourself something cuddly and colorful. You can play on our blog, in our Ravelry group, and on our Facebook page for three separate chances to win! - To drop an entry here on our blog, reply to this post and tell us what your favorite Mountain Colors colorway is. - To play on Ravelry, simply join our Ravelry group and then post in the giveaway thread and tell us what your favorite Mountain Colors colorway is. - To throw your hat into the ring on Facebook, just like our Facebook Fan Page. That’s it! Easy-peasy! We’ll be announcing the winner in exactly two weeks, on May 28, in a LIVE VIDEO DRAWING at 1 p.m. Mountain Time (3 p.m. Eastern) in our Ravelry group. Enjoy this chance to win some beautiful new yarn!! My favorite color has to be Winter sky! Though Clover is a really close second! I do like that Chinook. My all-time favorite is Mountain Twilight . . . but I love all the colors! I still love Rosehip best! Oooooh I think it's Mountain Twilight. It is extremely difficult to pick just one favorite! I really love northernlights and indian paintbrush, but copper mountain and ruby river are very nice too! My favorite color is Wild Raspberry! I like winter sky best! Favorite solid is Dusty Blue. Favorite multi is Bitteroot Rainbow. It’s a cross between harmony plum, heather, wild raspberry wildflower, or thunderstorm. I've been on a blue kick lately, and I'm trying to shift to another variety of colors! Gosh that was hard! I love Harmony Lake. It's like looking into a beautiful pool! There are so many gorgeous colorways, but this time I was drawn to the pastels of Chinook. Oh my goodness! There are so many gorgeous colors to choose from, but Harmony Moss has got to be one of my favorites! Oh! Meadow. And Winter sky. My favorite colorway this time is Trout Creek. It will probably change with the next project. Wild Horses. My eye can always pick it out. Love the colors! Favorite colorway is Lupine; though all of your colorways are beautiful. It would be Meadow since it has all my favorite colors in one. I love so many of the colorways, each time I think I've picked a favorite I see another that is equally stunning! I think I'll go with Heather, because I love the subtleness, but I also really love snapdragon and sapphire trail! Favourite colourway? You mean I have to choose? Wow! Some many wonderful choices. I guess the Harmony Mist because of the beautiful ble and green shades. There are so many pretty ones, but my current favorite is Osprey. Great color for my hubby as well as me! My favorite colorway is definitely Chinook! Right now Thunderstorm is at the top, but I love so many colors, very hard to choose. OH boy, a favorite .. that's hard. They are all so scrumptious! If I had to choose just one, I think it would have to be Northern Lights. It just shimmered! Beautiful! My favorite color is Day Break. My favourite has to be Lodgegrass, but they're all so lovely! I'm loving both Huckleberry and Mountain Sky. I'd have to close my eyes and point to choose between them. Picking colors is so HARD! I love Winter Sky! Indian Corn is my favorite! Love the colors! Mine would be a toss up between Chinook and Clover. Alpine is my favorite also! Thanks for the fun giveaway! I LOVE all the colors it is sooo hard to choose just one. I love in order lol... Wilderness, Goldrush, then Yellowstone. I am not a Solid color girl if I had to choose a Solid color I like the pink tones . I love both Juniper and Alpine! So very hard to pick just one! sierra is the one i like most!!! There are so many pretty ones, but if I must choose one, I choose hummingbird. I'm not sure what the name of the colorway I love is, but it's a darker colorway that I've used in several items. It might be dark rainbow or midnight or something like that. Wildflower! I also love ruby river, hummingbird, & rose hip! Granite Peak for SURE! The bits of rust and teal pop through the darkness. Heather is one of my favorites, its really hard to choose just one. It's hard to pick a favorite, but I really like Chinook. Moose creek although favorite colors change depending on my mood. But moose creek is what I'm most drawn to regularly. Hmmmm, this is hard but if I had to pick a favorite it’s between Northern Lights and Indian Corn. I have 3, with my topmost favorite being Portland Rose, second, Snapdragon, and third, Indian Paintbrush. Just looked and fell in love with Bitterroot Rainbow...beautiful!!! My favourite is Sun River, it's bright and fun! My favorite color is hummingbird!! My favorite is Mountain Twilight. But there are so many that I love. Thanks for making great yarn! Today, my favorite is Ladyslipper. It has been known to change, though. There are so many wonderful colorways but I think I like Osprey the best, then Harmony Lake and Copper Mountain. My favourite is Northern Lights ... but Alpine comes a close second! I'm so bad at narrowing it down! I really love: Spring Eclipse, Mountain Twilight, or Huckleberry. My favorite colorway is "Crazy woman". I wonder why? Juniper is my favorite, followed closely by Wilderness! I love Harmony Mist because the blues and greens remind me of sea glass. Oooh, my favorite is Gold Rush! Favorite color is Gold Rush, it jumped right off the page to my eyes.Olive is nice too. Love, love, love the Cedar. I love the Snapdragon colorway!!! I think Chinook is quite lovely. I LIKE INDIAN CORN THE BEST BECAUSE IN REMINDS ME OF THE LEAVES TURNING COLORS IN THE FALL. That's sort of like asking me to pick a favorite child.... :-) I'll go with Crazy Woman. I've worked with the Wildflower colorway before, and I loved, but I really like the look of Cedar. I love Alpine, second choice would be Clover, and then Wilderness. I would love working with all of them!! My favorite colorway is "Harmony Plum". Thanks for the nice giveaway! This was hard, but I think I like "Gold Rush" the best! My fave is Harmony Lake. Wonderful blue green colorway. I like Meadow a lot. Very pretty. CrazyWoman! I love Crazywoman! I'd really love to knit something with that beautiful yarn. Northern Lights is really pretty (as are many others)! Ohh… I really like Yellowstone. It reminds me of playing around in a pile of leaves as a child and brings back memories of a chilly fall afternoon, leaves that crunched underfoot, the taste of hot chocolate , and the smell of homemade pumpkin bread with apple butter on top. I really like the way you've combined the colors in Northern Lights - so pretty! Ladyslipper is my favorite... but only because you made me pick one! They are all beautiful! Moose Creek and Sierra are both really lovely! Moose Creek is my favorite colorway! I really love the Cedar colourway. My favorite color is Harmony garnet. Harmony Iris! Thanks for the giveaway. All are nice colors and I like chinook, peppergren and indianbrush. Thanks for giveaway. I've always wanted to try Rosehips. Our Yarn is on the cover of Knit, Swirl! !